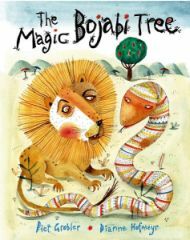 Dianne Hofmeyr’s retelling is drawn from her favorite among the many versions of this traditional African story. She attributes the first written version to a 1923 publication, The Bojabi Tree, and she has modified elements “to suit my particular story.” In this tale, “long ago” during a great drought, animals of the “plains of Africa” were desperately searching for something to eat when they came upon a beautiful tree with the most enticing-looking ripe fruit. However, a python wrapped around its trunk prevented them from reaching the fruit, flatly stating that the animals could only gain access to the fruit by telling Python the tree’s name. Tiny Tortoise suggests that the King of the Jungle (Lion) can help with the name, and three faster, larger, cleverer animals (namely zebra, elephant, and monkey) take turns asking him for the name. Although Lion obliges (each time growing more fiercely impatient), the three messengers fail to deliver a correct answer to Python. In the end, it is the small, slow, but methodical Tortoise that succeeds. Python mutely honors his promise, and the animals feast on the luscious fruit. Hofmeyr’s text retains the oral flavor of a storyteller, with vivid descriptions like, “The earth was as dry as a piece of old leather” or “a sweet-mango-melon-pomegranate tree”; short sentences, as in, “No rain fell. The grass shrivelled. Trees died”; and rhymes like the Tortoise’s mnemonic device: “Bojabi for you. Bojabi for me./What will bring down the fruit of the tree?” She also employs ear-pleasing nonsense words, such as, “bongani,” “munjani,” and “umfani” and ends the story with a question directed to the listeners/readers (“Now, do you know the name of this magical tree?”), which invites participation. She uses the repetition of events (three tries by other animals before Tortoise) and sentences (“But of course he was wrong and Python wouldn’t budge” as each one fails) to complement an oral telling. Finally, a common theme of traditional stories (the triumph of the underdog, the slowest and smallest animal prevailing) permeates this tale. Piet Grobler’s highly recognizable style of watercolor and pen illustration enhances the text. The washed out earth tones of the dry plains and the brilliant hot sun contrast with the vibrant colors of the bojabi tree, and the intricate stylized patterns on Python add fine detail. His immense size is depicted with the first half of the snake looped across the front endpapers and the second half across the rear endpapers. Depictions of Lion’s face as he grows increasingly furious (glaring eyes, cheeks flushed red, pointy teeth, ruffled mane, and protruding tongue) grab the viewer’s attention. In addition to the main characters, Grobler has positioned numerous other creatures that watch the spectacle with various expressions ranging from amusement to disbelief, annoyance, and perhaps even boredom. These animals add interest for young viewers who may enjoy identifying them and following their activities. The front cover features Lion and Python, perhaps sharing a silent secret or possibly regarding each other warily, while the back cover uses Python as an encircling border, while swallowing his tail with a gleam in his eye. The hand-lettered title and author-illustrator names also show Grobler’s unique style and complement the story’s content. The use of easily readable Hoosker Dont font for inserting the text directly in the illustrations was a good design choice, as well.